This is the cleanest storage facility I have ever seen. Staff is friendly and helpful. They smile and seem to enjoy their job, rare this day in age. Easy to find. Staff takes time with each person to assess their needs, and find the perfect storage solution for them. Ashley was very efficient, pleasant helpful. She took the time to show us the unit and explained all the details. Wonderful experience. Ashley could not have been more efficient or kinder. I would definitely recommend to a friend. A Wonderful experience. Ashley could not have been more efficient or kinder. I would definitely recommend to a friend. Wonderful staff they are very helpful and the facility is clean. Very easy to access. I called around for a place to store my RV. One closer to my home told me that he "had too much to drink" to sign up a new client. I contacted U-Store and they were extremely helpful, and not drunk! The the facility is nice, but the staff is the reason to become a client. Thank you for the great review Ryan! We strive to be the best self-storage facility in Walled Lake. We look forward to continuing to serve all of your storage needs! Great place to store. I have been here over a year, really friendly staff and and able to rent uhaul and have everything else needed. Great customer service, efficient, clean and friendly! Ashley was very quick and obviously knew what she was doing. Happy we chose this Adamkessler86@yahoo.complace for our storage needs. Ashley and everyone are very helpful. The units are extremely clean and well secure. I am very happy with the help and how courteous your employes are. Shawn and Ashley were very helpful,courteous, and kind. Would definitely Refer your place of business. Thank you for all your help. Best storage business around! Very clean with nice new door locks on the units! Super friendly reception! If I lived further the drive would be worth the service! Shawn was very nice and very helpful. I was very appreciative. The staff is incredibly friendly and helpful. The facility and the storage units are clean, welcoming, and very easy to access. Great hours. I looked into three storage units prior to choosing U-Store - it would be silly to rent anywhere else. The manager (Ashley) at U-Store is incredibly helpful and makes sure that all of the little details are taken care of. This may not sound like a lot, but when you consider things like monthly billing and move-in/move-out coordination - she's AWESOME! Thanks for a great experience - I will recommend this place to everyone I know. Your customer service agent Ashley was very friendly, helpful, and courteous. This is everything you may want from a storage facility. It's modern, well-kept, clean, quiet, professional, and secure within the customer service office and throughout the facility. The folks running the show are friendly and helpful. The fact that there are hundreds of units nearly guarantees availability. There are also useful items for sale inside to supplement your storage strategy. 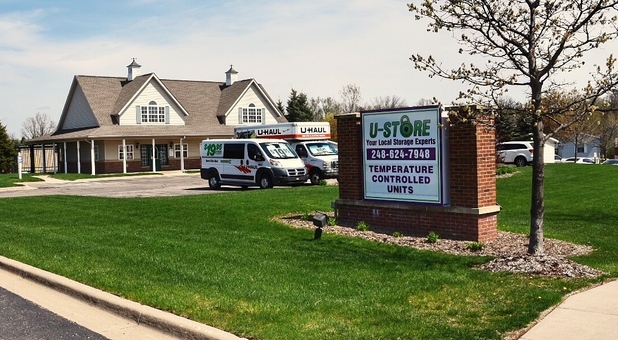 U-Store is nicely located so that it's quite central, not off the beaten path, yet still in a quiet part of the city. There's a nice sense of privacy when accessing your unit, no matter where it is; the units can't really be seen easily from the road or the surrounding community, especially if you're near the back or off to the sides. It even backs up to a pond and woods. For the experience you get, this place is a great value for what you pay. Many other nearby alternatives seem to be often out of availability, are too public, and/or look like McSketchville. You get what you pay for; play it safe here. For what it's worth, this is from my perspective from using their vehicle storage offerings. Rented u haul last week or so Shawn and Ashly answered all my questions. Thanks for your help. I worked with Shawn the other day. He got me all set up with moving into a unit and scheduling a u-haul. He was super nice and I'll definitely be back to see him. Best Self Storage Place Ever!! I've used selfstorage many times and this is the best place I've used. Clean with super friendly staff! Highly Recommend! Rented here for almost a year. New owners keep the place nice and are actually willing to help you. Excellent storage facility. New owners are great, very nice and they keep it very clean.